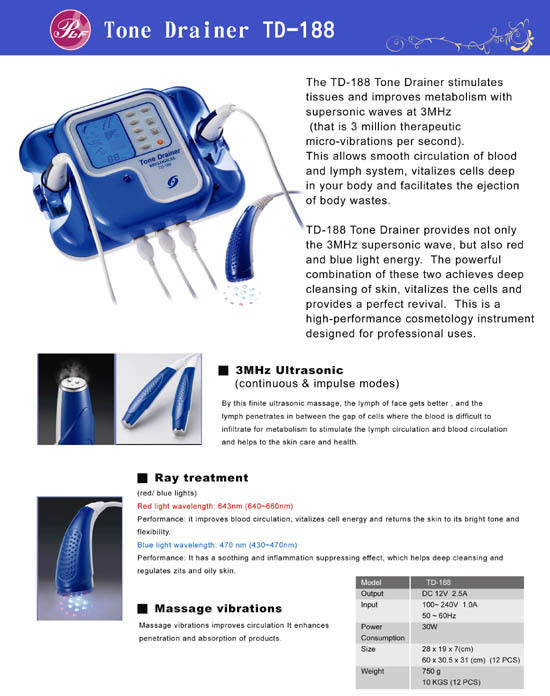 Taiwan Tone Drainer, Skin Care Equipment, Beauty Equipment - Palifull Co., Ltd.
1. It activates the original energy of skin. 2. Massage vibrations improves circulation. 3. Deep cleansing helps pore contraction. 4. It enhances penetration and absorption of products. 5. It vitalizes cells and accelerates metabolism. 6. It stretches wrinkles and firms up the skin. 7. It slows down the aging of skin. 8. It balances skins for regeneration and revival.